The Wild Horse Gallery features local, regional and national artists offering original oil paintings, pastels, watercolors, drawings, etchings, bronze sculpture, wood, glass, photography and limited edition prints from its historic downtown location in Steamboat Springs, Colorado, at the corner of 8th and Lincoln Avenue. The discriminating collector is provided a wide variety of exceptional artwork to choose from. Join us in beautiful Steamboat Springs for the Twenty-seventh Annual National Exhibition and Convention of the Oil Painters of America (OPA). Convention activities begin May 29th with the ever popular Wet Paint Competition. The opening reception will be held Friday, June 1st, at the Steamboat Art Museum - located across Lincoln Avenue from the Wild Horse Gallery. Many Wild Horse Gallery Artist are members of the OPA and several will be showing in the National Exhibition. Stop by the Wild Horse Gallery and the Steamboat Art Museum for an artistic feast prepared for the eyes, mind and heart featuring many of the OPA artists. Register and join one of the workshops by nationally acclaimed artists. For details please visit the the OPA web site. This page shows a complete catalog of the Giclee Prints of Richard Galusha. Click on the PDF Catalog link to download the file. Allow 2 to 3 weeks for delivery. Call 970-879-5515 or 970-819-2850 for more information or to place an order. 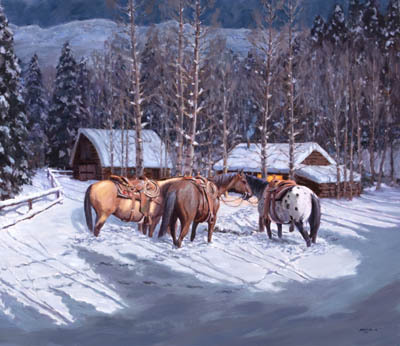 Richard Galusha, artist and Wild Horse Gallery owner with his wife Shirley Stocks, will be featured with a retrospective of his original oils and other paintings at the Steamboat Art Museum December 2019 through April 2020. More information to follow, including opening reception, dinner, and presentations. Please call Shirley at 970-819-2850 to make an appointment.